Just a gentle reminder… you have two more days to submit your social media marketing proposals in the $10K Genesis of a Good Idea contest. I'm sure you can come up with 250 words on the best way to spread the word about Genesis Today and their roster of nutritious (and delicious! really!) 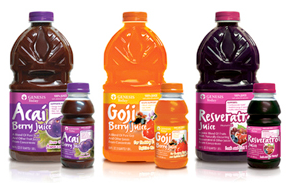 superfruit juice blends. The entrants with the five best suggestions will be flown to Austin to present their ideas in person. 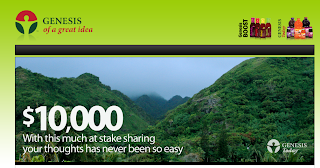 Don't forget to submit your big social media idea at Genesis of a Good Idea before Midnight CST on Sunday! Ugh, I really should enter this, but I have NO good ideas. I may be creative in some ways, but not others. And just the idea of presenting my idea to a panel would freak me out! Now Chris, on the other hand, he was a born speaker.